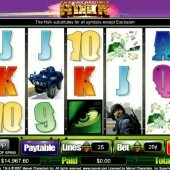 As you may already be aware, there is more than one version of Hulk as a slot game. There is the Playtech version simply called The Incredible Hulk and there is also an online slot released by Cryptologic known as The Incredible Hulk Ultimate Revenge. 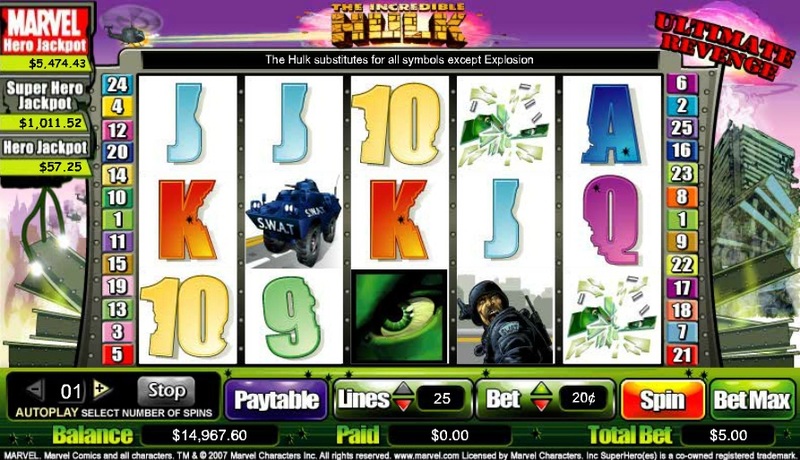 This is a 25-payline online slot connected to the Hero Jackpot, which all Marvel slots on the Cryptologic network have. The game is very simple with just one bonus round included. This is triggered by three or more explosion scatters and you are taken through to a new screen. You are faced by five helicopters, which plan to shoot you down. As the Hulk you select from a number of potential missiles in the form of police cars, motor bikes and anything else lying around in the street. You then select the helicopter to launch your makeshift missile at, which will reveal a free spins bonus and a multiplier. If you don't take the first offer then you will have to take the second, so good judgement is required here. Anything around 10 free spins at 3x and above should be taken in my experience. The hulk wild is also worth seeing on the reels, as it replaces all symbols except the scatter. All wins are multiplied by two, which makes things more interesting. The Incredible Hulk Ultimate Revenge is actually one of the better Cryptologic slots in my opinion, especially when compared to games like Just Vegas and Sushi Express. However, the bar is not that high for Cryptologic slots and most are trumped by slots from other companies like Novomatic.